MAKING SERVICE AND CUSTOMER SATISFACTION NUMBER ONE. 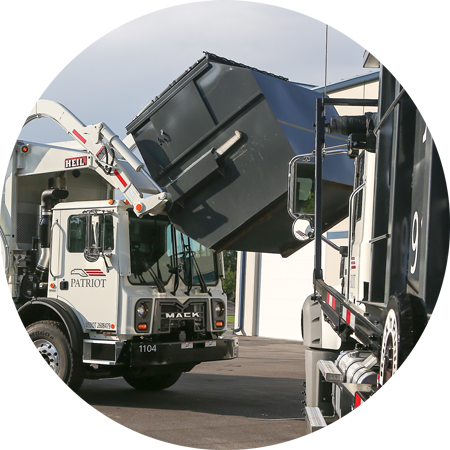 Patriot Sanitation Management offers commercial front load service as well as construction roll-off dumpsters to businesses throughout Wake and Johnston Counties. NO Annual Contracts and NO Hidden Taxes or Fees! Our commercial waste management services are offered at a consistent, fair rate based upon consumer pricing index. We please our customers first, not shareholders. SIGN UP TODAY FOR OUR NEWSLETTERGet updates in schedules and specials too! With more than 27 years of customer service experience as a co-owner of a green industry business, owner Ronald Williams started Patriot Sanitation after seeing the need for meaningful, reliable, personal relationships between waste management companies and their customers. Patriot Sanitation's principle is "address the needs of the customer". Their Pride is not based upon simply doing their job, but doing it with the utmost attention to detail and courtesies. Their Commitment to their customers is further expressed by providing cost adjustments based upon consumer pricing index and no annual contracts or hidden taxes or fees. Their Excellence in customer service means they do not rely on call centers, giving you direct customer access with faster response times. Patriot Sanitation goes the extra mile to provide you with the service you deserve! They value relationships and they are confident you will share their philosophy as they redefine what real "service" means in the commercial waste removal industry. You will experience dependable, responsive, friendly service for a fair price.